Way back in September I posted a teaser post on the beer I brewed for my brew clubs annual advent beer exchange. The beer itself is a Bière de Garde based largely on a recipe found in the excellent book American Sour Beers; specifically the Dark Winder Saison I (pg 336). This seemed to be an ideal winter beer – dark & somewhat malty, with rosemary, orange and raisins providing a unique spice character quite different from the classical winter spiced beer. My version differed from the original mainly in that it wasn’t soured; rather a house-blend of various Brett‘s was added for secondary fermentation. This beer surprised me somewhat – despite 3 months on Brett and oak, there was little funky character in the beer and it remained quite sweet (even though the final gravity was ~1.005). I’ve held onto a few bottles to see if this would change, but the beer has not picked up much more Brett character, despite an extra 1.5 months in the bottle. Even so, its a good beer, although if I rebrewed it I’d either brew it as a sour, or as a straight Bière de Garde without Brett. Recipe, Brewing Notes and Tasting Notes below the fold. -Recipe from American Sour Beers (Dark Winter Saison 1, pg 336); substituting house brett mix for dregs. -Hit protein rest near dead-on; 53 instead of 54; adding sacch water at boiling. -Raisin puree, orange zest (navel, 2 oranges) and rosemary added at end of boil. Next time blend the raisins into a small amount of hot wort prior to addition, as not all raisins dissolved properly. -Pitched & fermented at 26C, 2 weeks. -gravity was down to 1.011 after just 2 days! -Transferred to secondary after 10 days, added 1oz port-soaked medium-roast american oak. 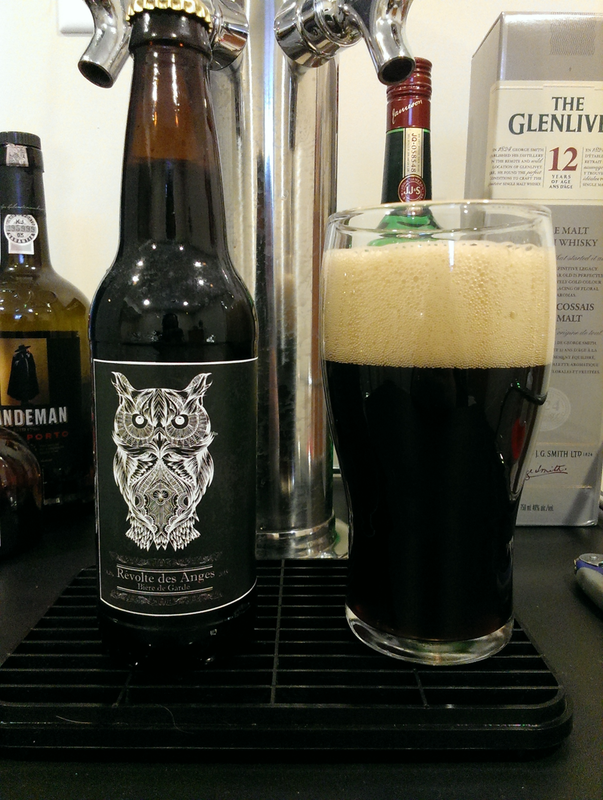 Appearance: Beer pours dark brown, almost black, with a beige long-lasting head. 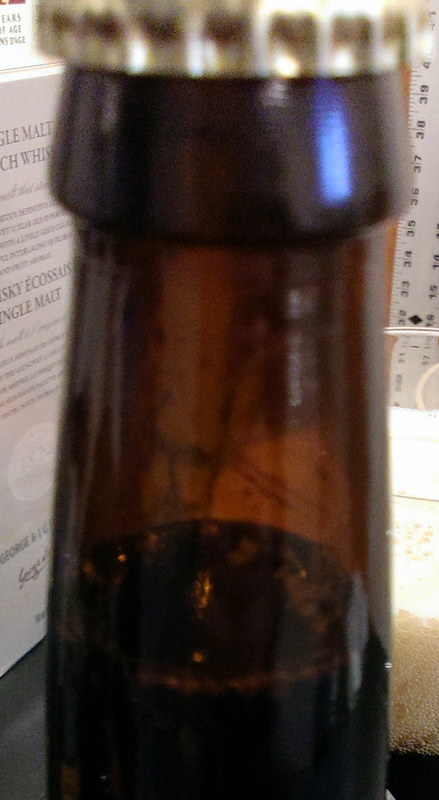 Strangely, a small amount of what appears to be yeast rafts has formed in the bottle (picture to left). Aroma: Rosemary and raisin predominant, along with some malt character. Orange character is present, but subtle. No apparent Brett aromatics. Flavour: The beer ended up being very complex, and much to my delight, undergoes a nice evolution of flavours as the beer warms. When served the beer is somewhat sweet (surprising, given its 1.005 bottling gravity) with a notable rosemary note, alongside s subtle orange and stone-fruit character. Malt character is present, with some roastiness. As the beer warms additional flavours come out – a slight brett phenolic note (leathery), along with a bit more of a herbal (almost mint) flavour. Beer is whetting on the aftertaste, despite its thinner body, with a slight lingering herbal flavour and malt sweetness. Mouthfeel: Thin, as expected, but not dry (which is what was planned). Somewhat of an odd mix – thin body, and yet whetting and slightly sweet on the finish. Overall: Overall I really like this beer, as did many in the advent event. Its a complex beer, perfect for sipping on a cold evening, with enough unique flavours to keep things interesting. In the future I think I’d brew this with an eye towards a little more body, and I think I’d drop the Brett entirely.